It’s been a while since we have visited Data Analysis Expressions (DAX) on this blog, but now we’re going to jump right in and discuss working with semi-additive measures. Semi-additive measures can’t be added across all dimensions, typically they can’t be added across the date/time dimension. Common examples of semi-additive measures are account balances and inventory levels. Inventory levels can be added up across products, across different stores, but not across time. If you have 500 silver widgets at the end of day on Monday and you have 500 silver widgets at the end of day on Tuesday, how many widgets do you have? You only have 500 of course! We have to take this into consideration when building our model and measures. The same is true of account balances as well. If I have $100 in my account on February 1st and I have $85 in my account on March 1st, what is my account balance? It’s only $85, it’s not the sum of both months. Remember, this measure is valid for all the dimensions in my data model except for my date dimension. Similar to inventory levels and account balances we don’t want to add the closing stock price across time, this produces incorrect results. 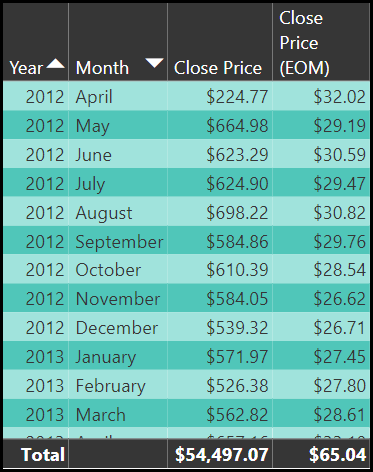 Back in 2012 the stock price of MSFT stock was around $30 a share, however, when I display our measure in a table with the year and month what we actually see are numbers that are much higher. This is because the measure is adding up the stock price for all days of the month and this is incorrect! Definition: Evaluates the expression of the last date of the month in the current context. 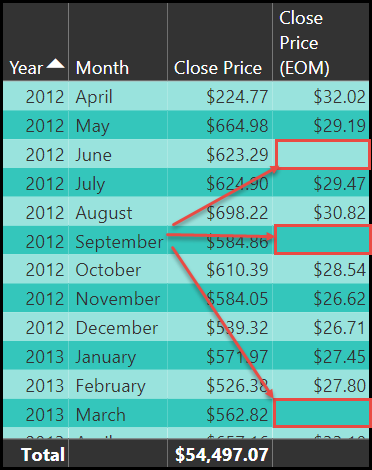 Most months we are getting the correct value, but some months are blank, why? CLOSINGBALANCEMONTH returns the closing price of the stock for the last day of the month, unfortunately we are looking at stock market data and the stock market is not open every day of the month. 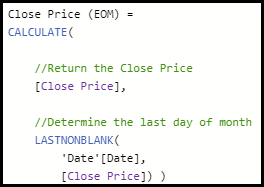 So therefore, if the last day of the month has no closing stock price, then blank is returned. See screenshot below. This is typically not what we want when looking at semi-additive measures! We want to return the closing balance for the last day of the month that had a value. LASTNONBLANK IN DAX to handle blanks! 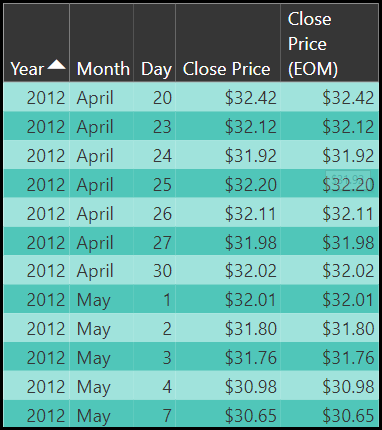 We need to write a measure in DAX that is going to determine the last date of the month where the stock market was open. We are going to solve this problem by using the function LASTNONBLANK. This is an extremely useful and helpful function. 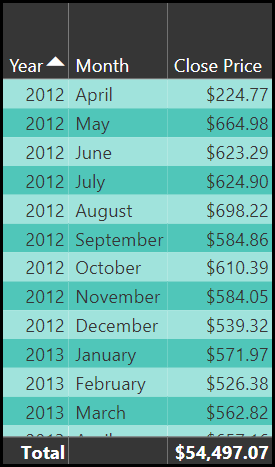 Definition: Returns the last value in the column, filtered by the current context, where the expression is not blank. Next, I will add this new measure to our table for validation. Everything looks perfect! 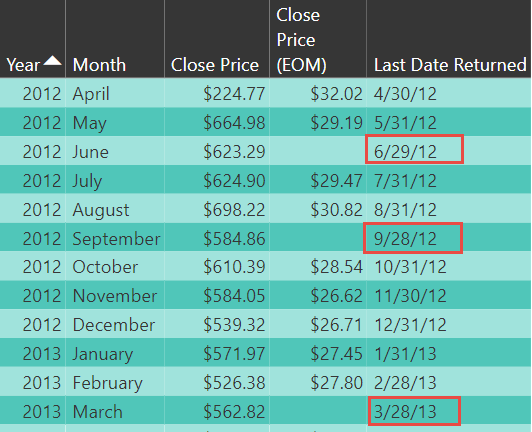 The measure is not blindly returning the last day of the month, it’s returning the last day of the month that had a closing price for the stock, meaning the value returned for June, September, and March is exactly what we need. BOOM! Winner winner chicken dinner, I’m taking the rest of the day off and going to the beach! Wait a minute…. was the topic false positive? Are the results above correct? Yes the are, just take my word for it or else this blog post is going to really, really long. However, it’s really easy to author formulas in DAX that work at one level but don’t work at other levels, and this is because of Filter context. As developers we have to always consider how the end users might slice the data. For example, if a user is looking at the data at the day level, will our measure still return he closing price for the month? Let’s check. Immediately, we see two different items that tell us the measure is definitely not returning the end of month close price. First, the close price and the close price (eom) measure have identical values, this means our closing month measure is displaying the closing price for each individual day. That tricky filter context got us again! 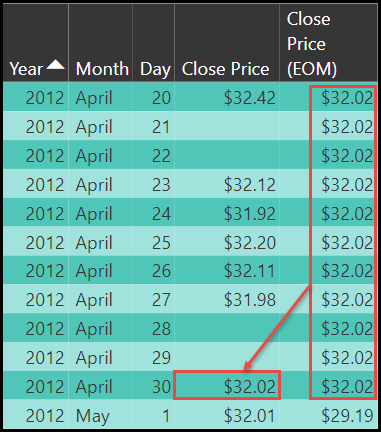 Secondly and most obvious, the close price (eom) values should be identical for every day of the month, they are not. Clearly this measure is not working. Back to the drawing board. Go back and look at the definition for LASTNONBLANK, it works within the current filter context so when we filter our report down the day level it can only return that day. Now it’s time to introduce you to one more function in DAX and that is the PARALLELPERIOD function. Definition: Returns a table that contains a column of dates that represents a period parallel to the dates in the specified dates column, in the current context, with the dates shifted a number of intervals either forward in time or back in time. 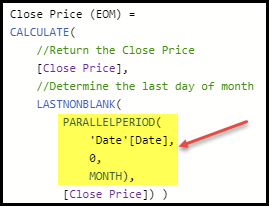 The PARALLELPERIOD function will return all the dates in the interval that we specify within in the current context. What does that mean??? If you were looking at January 1st and you used PARALLELPERIOD to return all the dates at the month level then a table would be returned with all 31 days for January. This means that we can now return the closing price for the month even if the user is exploring the data at the day level!! I can feel your excitement as I write this.